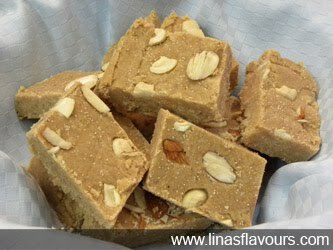 Sukhdi or Gud Papdi is a famous Gujarati and Maharashtrian confectionery (mithai/sweet) made from wheat flour, jaggery and ghee is prepared on any occasion. Take a pan and heat ghee. Add wheat flour and sauté till it turns light brown. Add ginger powder, nutmeg powder and sauté it for 2-3 minutes. Switch off the gas stove. Add jaggery and mix it well. Grease the dish with ghee and pour the mixture in the dish. Garnish it with poppy seeds, almonds or cashew nuts. Cut into diamond shapes and serve it immediately. You can even store it for 8-10 days.